In late 2013 and early 2014, five of our Reportage photographers undertook a group project, commissioned by the ICRC, to document landmines, cluster munitions, and unexploded remnants of war. The work was created for an exhibition at a major global summit on the subject: the 3rd Review Conference of the convention on the prohibition of the use/stockpiling/production/transfer of anti-personnel mines, and on their destruction), which took place Monday 23rd – Friday 27th of June 2014 in Mozambique’s capital Maputo. For this project, Brent Stirton worked in Mozambique, Veronique de Viguerie in Bosnia, Marco Di Lauro in Iraq, Sebastian Liste in Nicaragua, and Paula Bronstein in Laos. 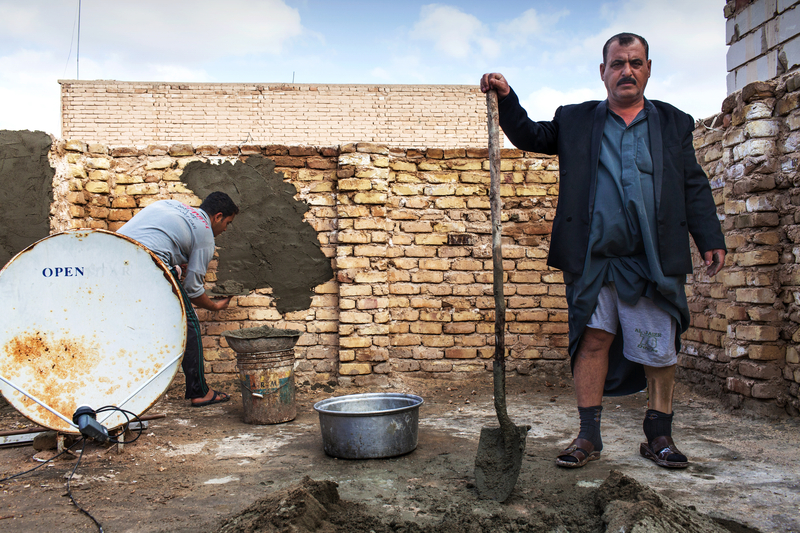 This feature showcases Marco Di Lauro’s work from Iraq. A full edit of 119 images by Marco is available on request. Balancing on his right leg, the stump of his left leg dangling from his rolled-up trousers, Bonifacio Mazia plunges his hoe into the earth. The toes of his single foot grip the soil as he puts his back into the swing. His steadiness and intensity are palpable. He jerks up a clod of red dirt, hops forward, rewinds and swings again. Mazia’s left foot was blown off by an anti-personnel landmine on February 2nd, 1985, during the height of the civil war in Mozambique. He was a farmer, not a soldier. “I started screaming, crawling down the path,” says Bonifacio. His left leg was eventually amputated just below the knee. Ever since, he has dreamed about the man he might have been. Anti-personnel landmines are a scourge of the modern world, one of the few weapons of war that continues to kill and maim for years, often decades, after the war is over. Unlike bullets, which stop flying after the peace agreement is signed, landmines lie in the ground, primed, waiting for the innocent and the unsuspecting. Pol Pot, the genocidal leader of Cambodia’s Khmer Rouge, once called landmines his “perfect little soldiers.” And yet in 2012, only 18% of victims of landmines and explosive remnants of war (ERW) were soldiers; 4% were deminers and the rest, 78%, were civilians, almost half of whom were children. In 2012, antipersonnel (AP) mines continued to cause casualties in 30 countries, long after the armed conflicts had ended in most of them. Mozambique is a sobering example. A ten-year war of independence from Portugal (1964-1974), followed by fifteen years of civil war (1977-1992), left all ten provinces of Mozambique poisoned with anti-personnel and anti-vehicle mines. All factions in both wars used land mines, offensively and defensively, resulting in pervasive mining of roads, footpaths, village streets and electricity towers. Today, Mozambique is one of the world’s poorest countries, with over half the population still surviving as subsistence farmers. Since 1993, the United Nations and multiple NGOs, including the HALO Trust, Handicap International, APOPO and the Norwegian Peoples Aid (NPA), have been steadily demining the country in collaboration with Mozambique’s National Institute of Demining. “Mozambique will be completely demined by the end of 2014,” declares Alberto Maverengue, Mozambique’s director of the National Institute for Demining. 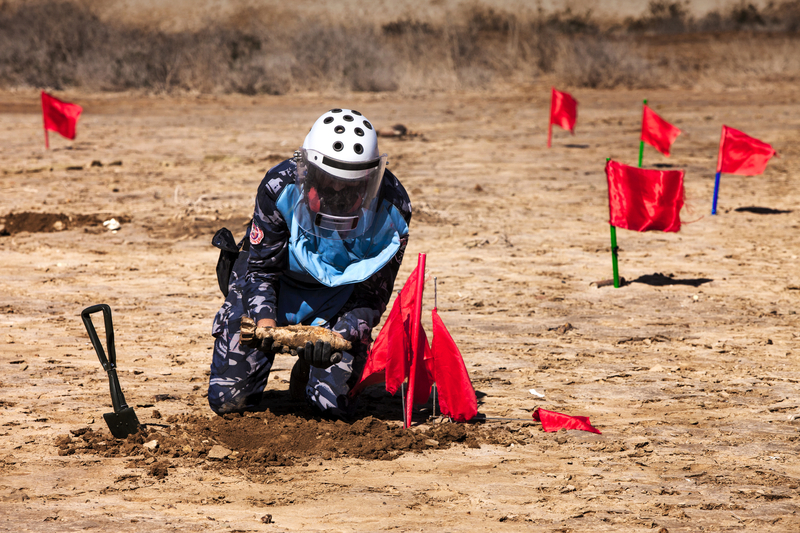 The substantial progress in demining and landmine survivor assistance throughout the world can be largely attributed to the 1997 Anti-personnel Mine Ban Convention, commonly known as the “Ottawa Treaty.” This treaty bans the use, stockpiling, production and transfer of AP mines. Today, 161 countries (over eighty percent of the world’s states) have joined the treaty, Bulgaria to Burkina Faso, Lithuania to Liberia, Surinam to South Africa. However, thirty-six countries are not yet party to the treaty, including most countries with large militaries: China, India, Israel, Iran, Pakistan, Russia, Saudi Arabia and the United States, and efforts to get those states on board continue. Nicaragua is one of the countries that ratified the treaty early, in 1999. Sixteen of its seventeen provinces were mine-affected, particularly rural communities and poorer areas. Just eleven years later, in 2010, Nicaragua was declared mine free, having cleared over 179,000 anti-personnel mines from its territory as well as half-a-million unexploded ordnance. Today, all Central American countries are mine free. But AP landmines aren’t the only deadly devices left behind when a war ends. There are also explosive remnants of war, or ERW, which include all other weapons that are still active – grenades, mortar rounds, tank shells, and cluster munitions. Cluster bombs are peculiarly pernicious. Unlike typical bombs, the standard cluster bomb is filled with several hundred apple-size bomblets which, when ejected mid-air, spray out over a vast, unpredictable area. The bomblets are designed to explode on impact, but a certain percentage do not detonate. Laos is a country deeply afflicted with cluster munitions. During the American/Vietnam war, between 1963 and 1972, at least 270 million cluster bomblets were dropped on Laos, with tens of millions failing to detonate. The war officially ended in 1973 with the signing of the Paris Peace Accords, but since the end of conflict, over 20,000 Laotians have been killed or maimed by cluster submunitions. As with landmines, children are often victims of bomblets. Being the size of a tennis ball, bombies entice children to pick them up. On January 4th of this year, in Hangsing village in the district of Pakxan, a group of three boys, ages 9, 10 and 11, were out on their bicycles, found a bomblet in a field, and decided to carry it home to their village. The bomblet was accidently dropped, exploded, and killed all three youths. Urged on by civil society, UN agencies, the Red Cross and Red Crescent Movement, in May 2008 a group of states adopted the Convention on Cluster Munitions (CCM). Inspired by its predecessor, the Anti-personnel Mine Ban Convention, the CCM bans the use, production, transfer and stockpiling of cluster munitions. As of April 2014, 84 states have joined the Convention and another 29 have signed and are moving toward ratification. Thirty-four states continue to develop over 200 types of cluster munitions, including China, Russia and the U.S. In the coming decade, as thousands of square kilometers of land in scores of countries are painstakingly cleared of landmines and ERW, energy and money must pivot more toward the rehabilitation of survivors. Iraq is a good example. Even though the country remains in a state of violent sectarian conflict – the total number of mine/ERW survivors in Iraq is estimated to be 48,000 to 68,000 – the International Committee of the Red Cross is supporting ten rehabilitation centers across the country. 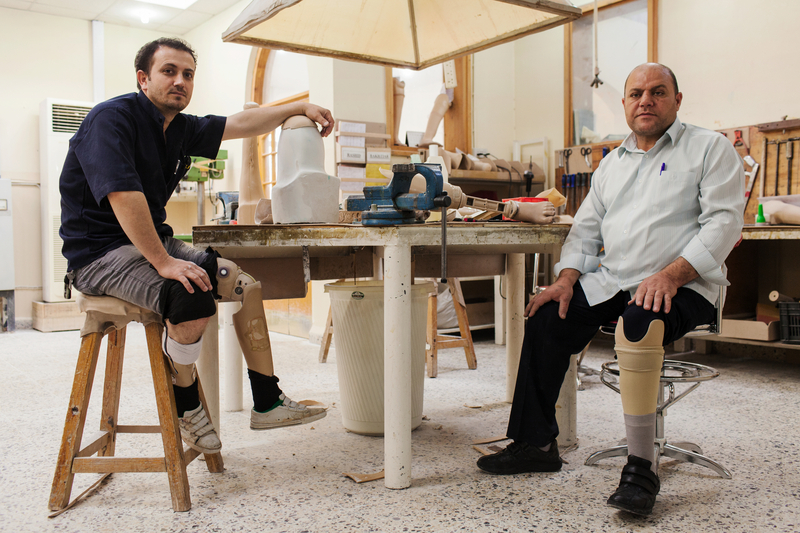 Clean, well-lit, and staffed with caring professionals, these centers have technicians that build and fit prosthetics to survivors, as well as physiotherapists that help these men, women and children relearn how to walk. The ICRC rehab centers in Iraq have treated 33,000 patients. In the past two decades the world has substantially changed. In the early 90’s, the U.S. State Department estimated that there were 24,000 landmine casualties a year. Then came the AP Mine Ban Convention in 1997 and the numbers began to drop precipitously. Ten years ago, the Landmine Monitor, a detailed annual report from the International Campaign to Ban Landmines, estimated that there were 15,000 landmine casualties a year. In 2012 there were just 3,628 casualties. In 2008, only a handful of countries supported the prohibition of cluster munitions; today, more than half the world’s nations have joined the CCM. Thanks to the Convention, 22 countries have destroyed over 1 million cluster munitions and 122 million submunitions. Some 50 countries that once manufactured cluster munitions have entirely stop producing these weapons. The trend is broad and deep and permanent, although the planet will not become completely free of landmines and cluster bombs until the major military players sign on. In June 2014, Maputo, Mozambique will host the Third Review Conference of the Anti-personnel Mine Ban Convention. The Maputo conference follows the 2009 Cartagena Summit and the 2004 Nairobi Summit, both of which recognized, advocated and facilitated unabated mine clearance and victim rehabilitation. The Maputo Review Conference will mark fifteen years since the original Ottawa Treaty entered into force. So very much has been achieved, and yet so much has yet to be done. Human progress has always been two steps forward, one step back – but if the path is cleared, progress can be made. Anti-personnel landmines are a silent yet open wound of the modern world. As one of the most merciless of war legacies in an already devastated region, their treacherous presence continues to indiscriminately affect the lives of innocent civilians long after conflicts have ceased. “A Legacy of War” aims at shedding light on some of the lives of over 48,000 survivors of landmine explosions in Iraq, one of the most cluster-contaminated countries on the globe. Experts predict it will takes about 25 years to clear the damage. On any given day, farmers, sheep herders and pass-byers are at risk of stumbling upon an unexploded cluster munition. One of the victims, Sajad Faleh, was four when he and his brothers detonated by accident some explosive remnants in the city of Simawa in 2006. His older brothers were instantly killed, and he has been an amputee since. The lives of landmine-explosion casualties have been altered forever. The mere act of standing or sitting among friends, peers and family or posing for a picture becomes an act of bravery that highlights the gruesome aftermath of war. However, there are glimmers of hope for these victims. Sajad’s path to recovery began when he was given prosthetic legs at a rehabilitation center run by the International Committee of the Red Cross. He was joined by Iraqi men and women of all ages who were also learning to stand and walk again. Almost half of the mine casualties in Iraq are children. For this reason, mine educational programs in schools are of paramount importance. 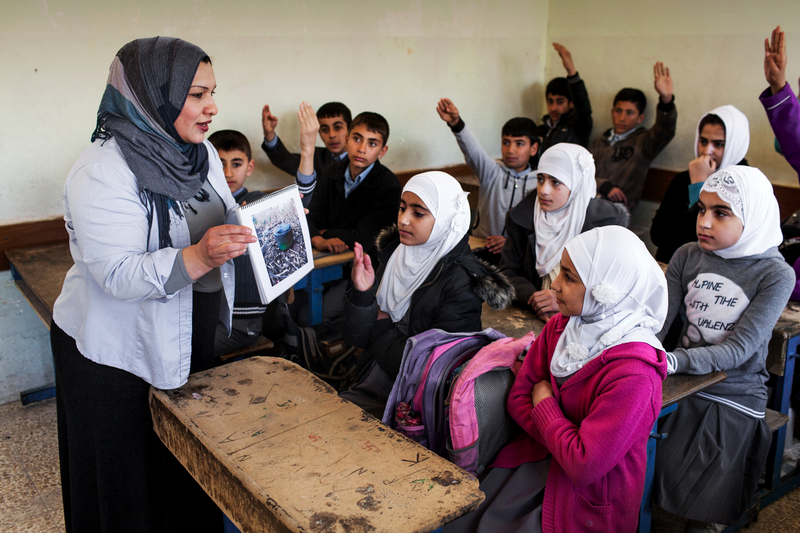 Some of the pictures depict Mines Advisory Group personnel explaining to young boys and girls the danger they may face upon their return from school. Awareness has, however, risen over the years. Thanks to international bans and conventions, the number of landmine casualties has decreased by 60 percent since the 1990s. Nations have also started destroying cluster munitions and clearing contaminated territories. 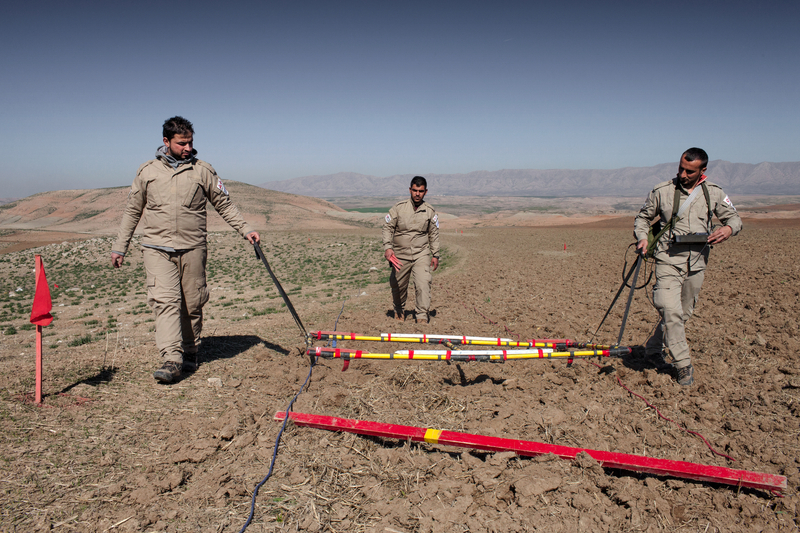 “A Legacy of War” follows the meticulous and dangerous work of the Iraqi deminers who work for up to ten hours a day to locate, deactivate and remove landmines or cluster munitions. Such an effort is far from sufficient. Only a handful of international operators are conducting the survey and clearance works for humanitarian reasons. Amid poor funding, most of the task is carried out by contractors working only in the areas of interest to the oil companies that employ them. As many in the West believe that the war in Iraq–and its crudest consequences–are over, many locals feel their lives have a premature expiry date. Landmine-contaminated fields are a threat to agricultural development, water delivery and, above all, to thousands of human lives. These pictures were taken so that the pain of amputees, relief workers, clearance personnel, could not only be relieved, but could also contribute to raising awareness beyond Iraq’s borders. 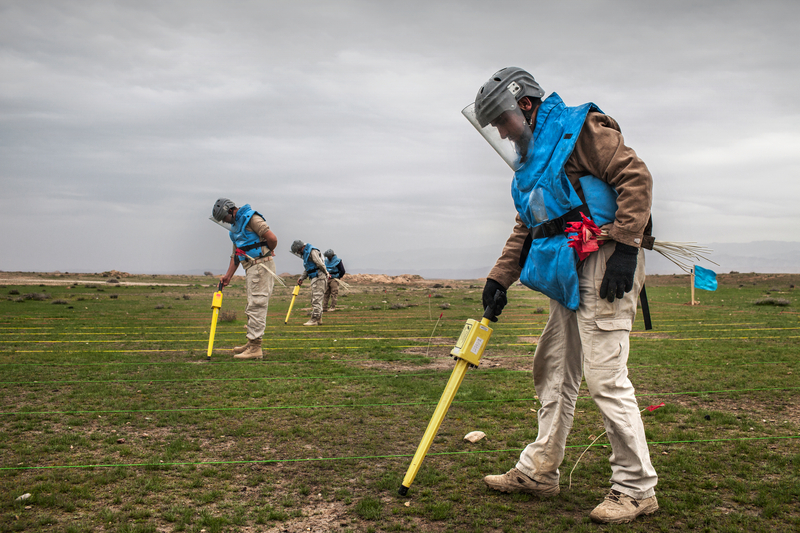 IMCO (Iraqi Mine Clearance Organization) deminers are seen practicing the clearing procedure to clear a field from unexploded remnants. The contaminated area in the Wermizyar village on which IMCO has started the clearing process on January 25, 2014 is about 972,000 meters square of which 77,760 meters square have already been cleared. 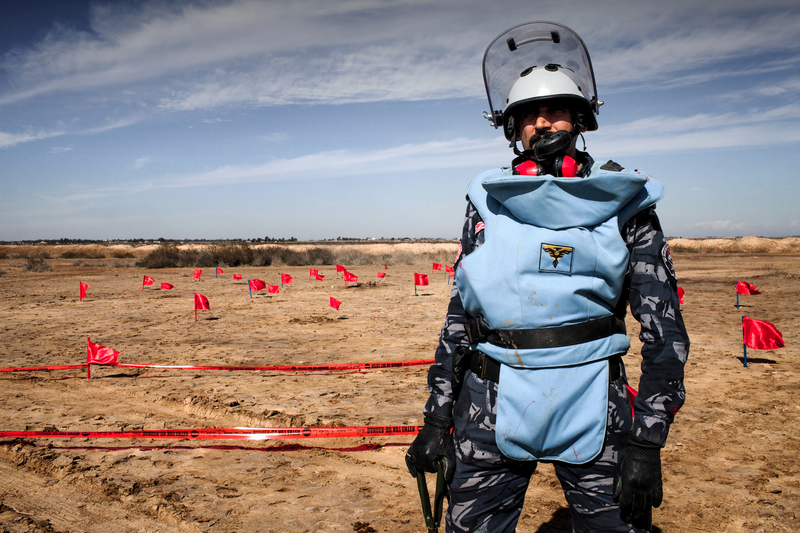 An Iraqi Civil Defense Officer is seen as he practices the clearing procedures of an area contaminated by anti-personnel land mine and explosive remnants of the Iran-Iraq. This area was an Iraqi Army site used as a storage for anti-personnel land mine. The Iraqi Civil Defense started clearing the twenty-four kilometers square area about a year ago and they still have to clean seven kilometers square. 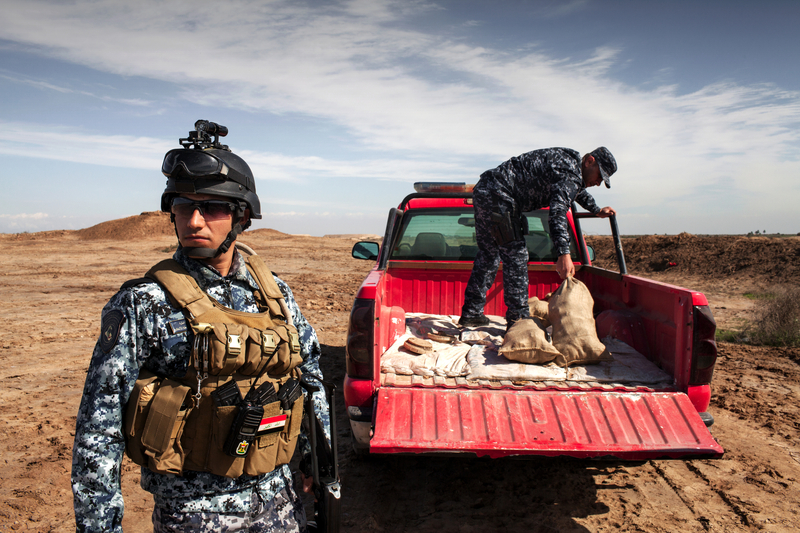 An Iraqi Civil Defense Officer is seen as he practices with an explosive remnants the clearing procedures of an area contaminated by anti-personnel land mine and explosive remnants of the Iran-Iraq war. This area was an Iraqi Army site used as a storage for anti-personnel land mine. The Iraqi Civil Defense started clearing the twenty-four kilometers square area about a year ago and they still have to clean seven kilometers square. Iraqi Civil Defense Officers are seen as they store anti-personnel landline and war remnants on their truck after clearing an area contaminated by anti-personnel land mine and explosive remnants of the Iran-Iraq war. This area was an Iraqi Army site used as a storage for anti-personnel land mine. The Iraqi Civil Defense started clearing the twenty-four kilometers square area about a year ago and they still have to clean seven kilometers square. 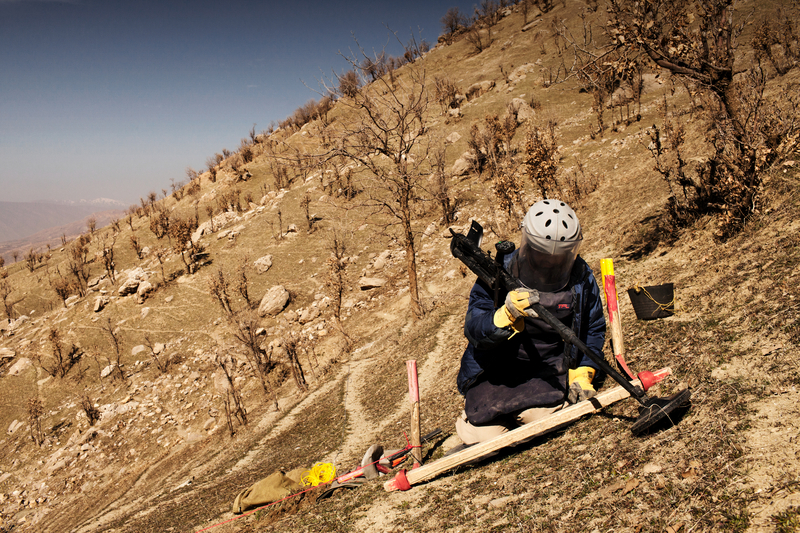 An Iraqi deminer from IKMA (Iraqi Kurdistan Mine Action) is seen as he practices the demining procedure next to the Zimali Shekhi Mine Field. The mine were placed by Iraqi Army in 1984 against the Peshmerga. The extension of the mine field is of 68,000 square meters. MAG (Mines Advisory Group) deminers are seen as the conduct battle area clearance (BAC). MAG BAC activity includes identifying the unexploded cluster bombs in the targeted fields, mark them with signs and hand over to the demining department for action. Bassim Miftin, 35-years-old is seen on his wheelchair at his house. Bassim was a shepherd and as he was attending his animals he stepped on an Italian made Valmara anti-personnel landmine on October 24, 2004 in the village of Zorbatya. The landmine was brought down the valley from a river floating and he lost the left leg above his knee and had injuries on the right foot. Wissam Ali, 33-years-old is seen at his house. 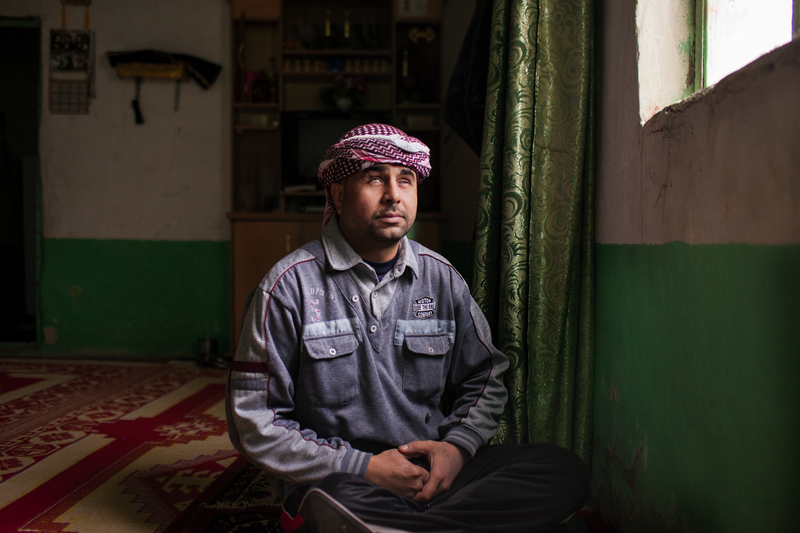 Wissam worked as a farmer and as he was watering his land he got injured by the shrapnel of an explosion of an anti-personnel landmine on April 29, 2003 in the mountains in the Wassit Province. Mohammad Aloqy, 51-years-old is seen at his house. 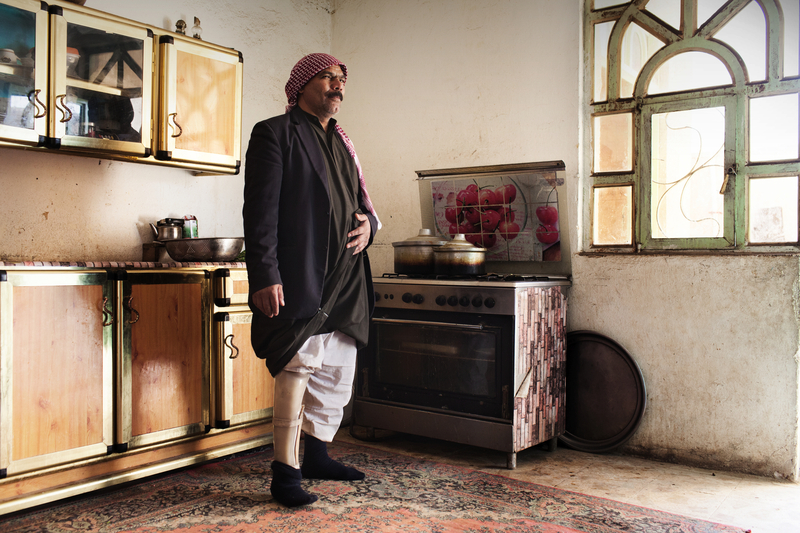 Mohammed lost his left leg below the knee as he stepped on a landmine in the mountains of the Wassit Province on December 31, 1992 while was a soldier in the army. 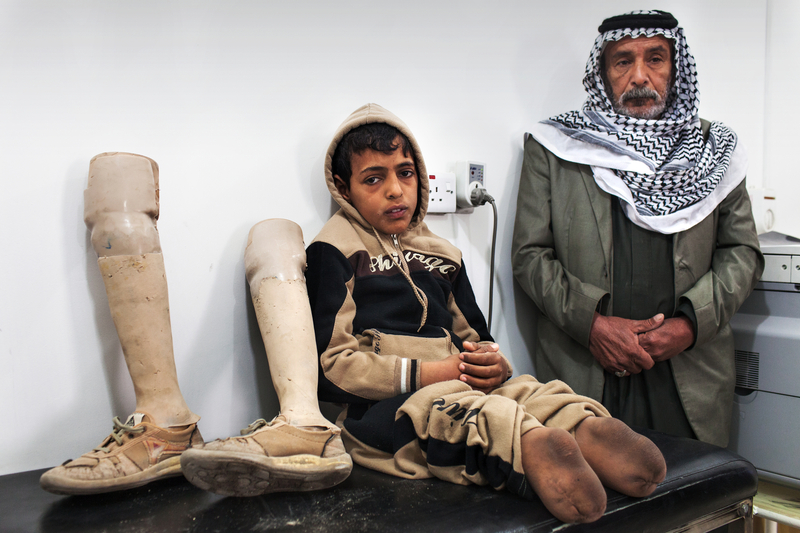 Sajad Faleh, 12-years-old is seen next to his father during his assessment at the PRC (ICRC’s Physical Rehabilitation Center). Sajad lost both legs on January 1, 2006 in the city of Simawa in the province of Muthana. 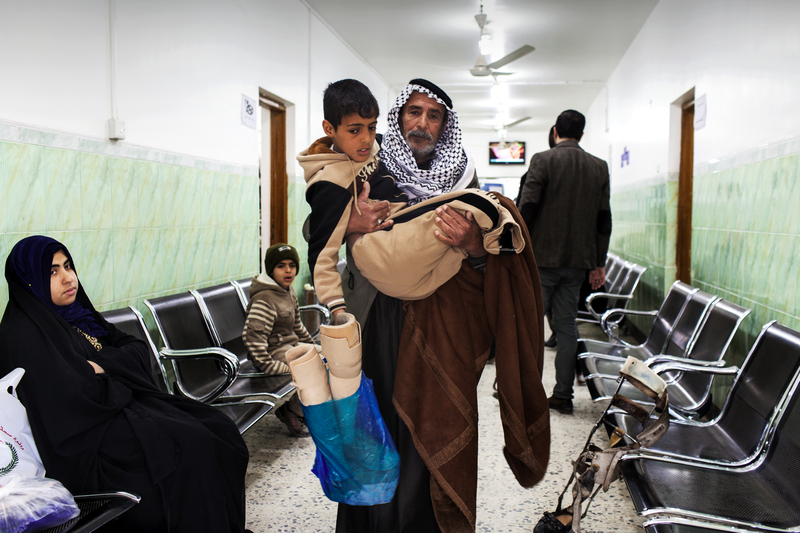 Sajad Faleh, 12-years-old is carried by his father after his assessment at the PRC (ICRC’s Physical Rehabilitation Center). 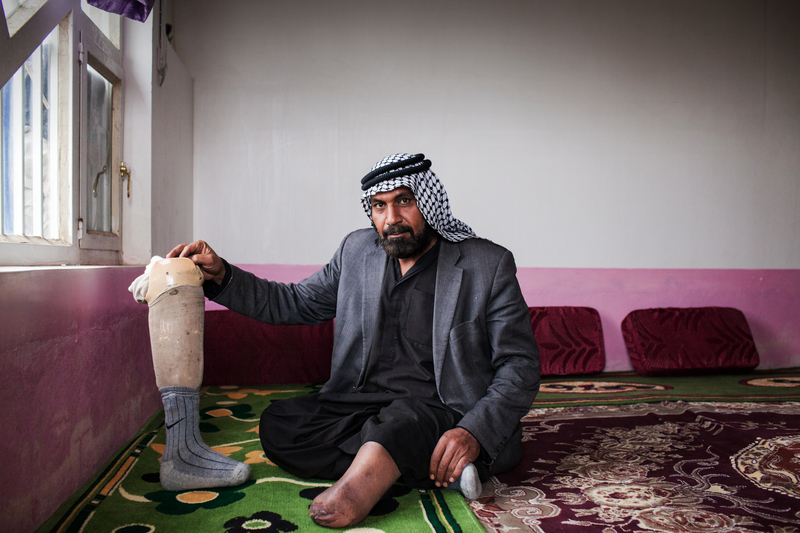 Sajad lost both legs on January 1, 2006 in the city of Simawa in the province of Muthana. 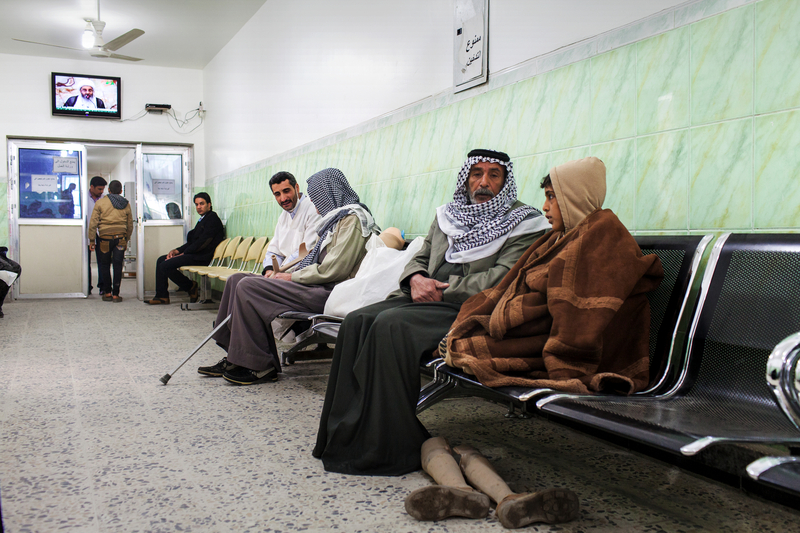 Sajad Faleh, 12-years-old is seen with his father during his assessment at the PRC (ICRC’s Physical Rehabilitation Center). Sajad lost both legs on January 1, 2006 in the city of Simawa in the province of Muthana. 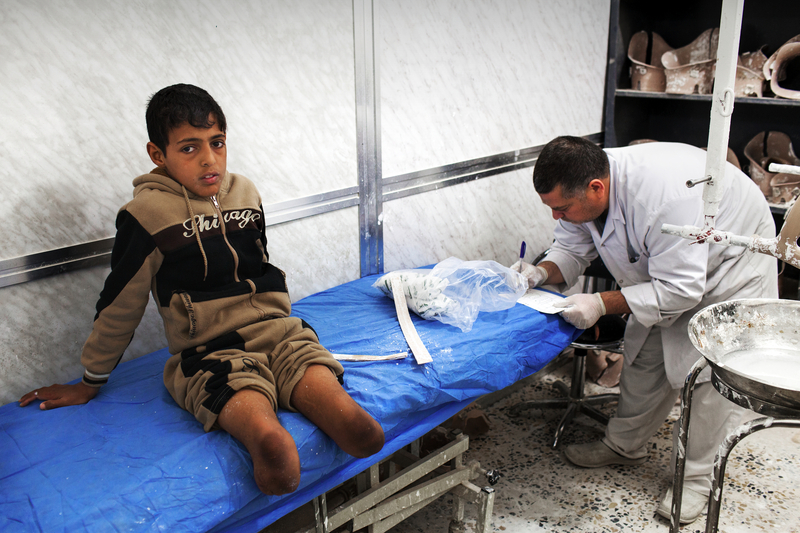 Sajad Faleh, 12-years-old is seen during his casting at the PRC (ICRC’s Physical Rehabilitation Center). Sajad lost both legs on January 1, 2006 in the city of Simawa in the province of Muthana. Sirwan Ali Ahmad, 46-years-old is seen at his house with his son Ahmad. 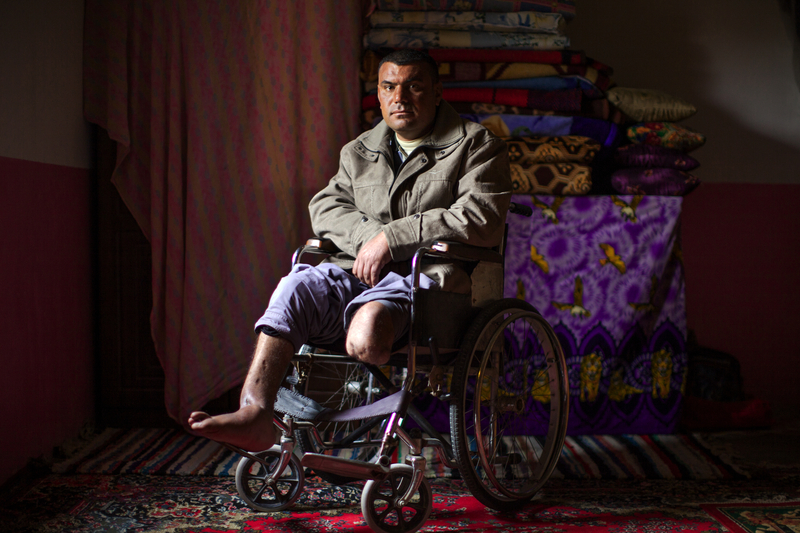 Sirwan lost his right foot below the knee in March 1991 at the border with Iran as he was trying to flee to the Qaldra area due to the fighting and he stepped on a landmine. Sirwan Ali Ahmad, 46-years-old is seen during his casting for a new prosthetic leg at the ICRC Erbil Physical Rehabilitation Centre (PRC). 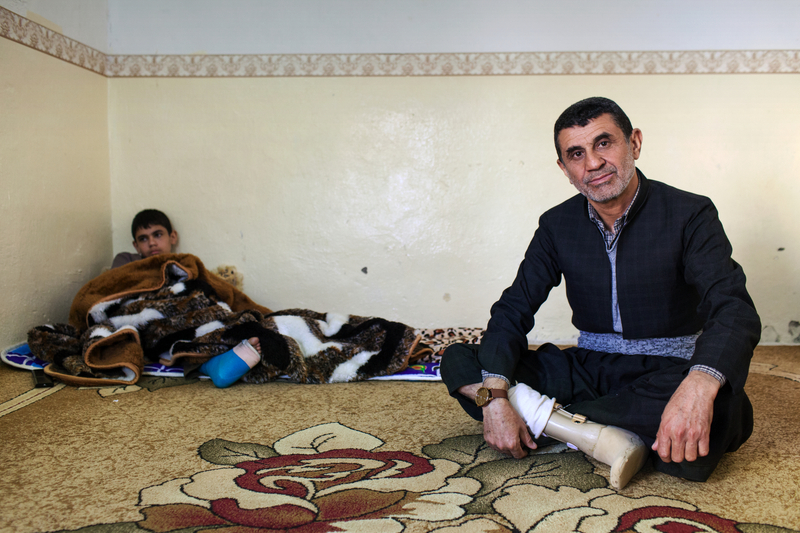 Sirwan lost his right foot below the knee in March 1991 at the border with Iran as he was trying to flee to the Qaldra area due to the fighting and he stepped on a landmine. 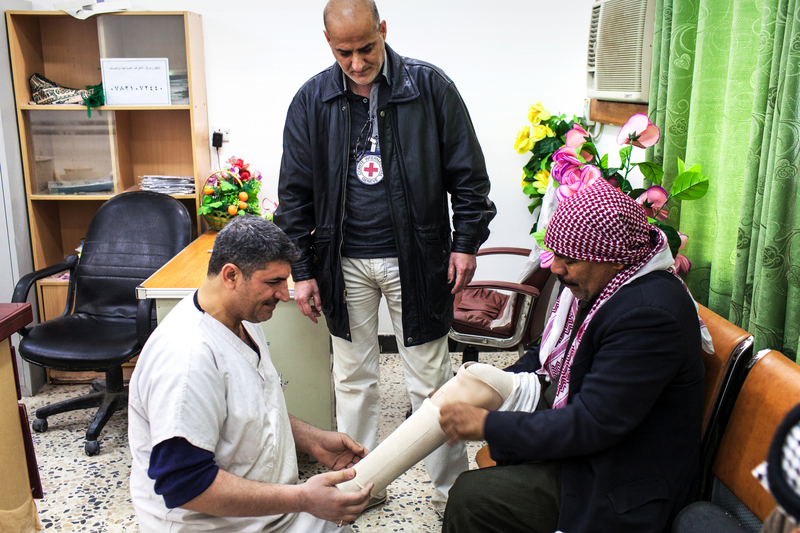 Raheem Muslim, 45-years-old is seen during his cast at the PRC (ICRC’s Physical Rehabilitation Center) Raheem was a military engineer and as he was working in Erbil preparing a bunker in July 1988 he stepped on an anti-personnel landmine and he lost his left leg below the knee. Raheem Muslim, 45-years-old is seen at his house. Raheem was a military engineer and as he was working in Erbil preparing a bunker in July 1988 he stepped on an anti-personnel landmine and he lost his left leg below the knee. From left: ICRC bench workers, Nafiz Raouf Tahir, 34-years-old and Bakhtyar Ismal Mohammad, 43-years-old are seen at work at the ICRC Erbil Physical Rehabilitation Centre (PRC). 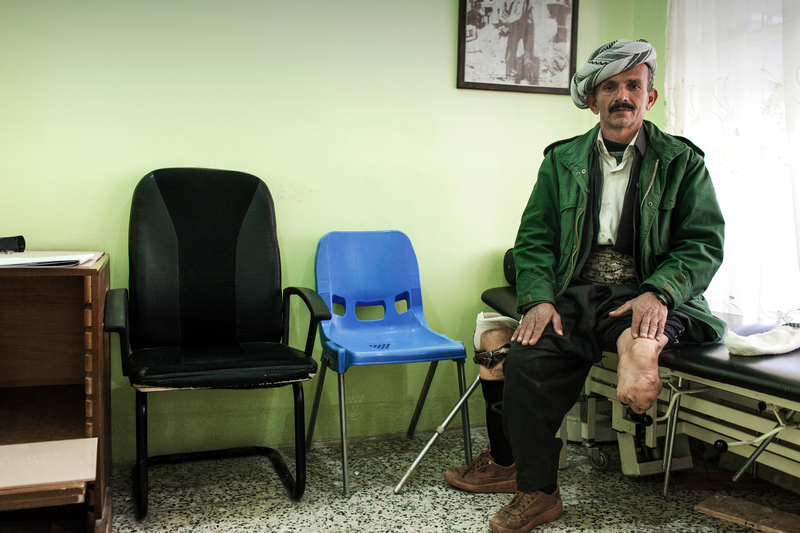 Nafiz lost both legs, the left one above the knee and the right one below the knee in 2003 in the Altunkopry village in the Kirkuk district. Bakhtyar lost the left leg below the knee on September 15, 1996 as he stepped on an anti-personnel landmine while working as a smuggler across the Iraq-Iran border in Garmyan. Iraqi patients whom lost their legs are seen during the training to learn how to use their new prosthetic legs at the ICRC Erbil Physical Rehabilitation Centre (PRC). 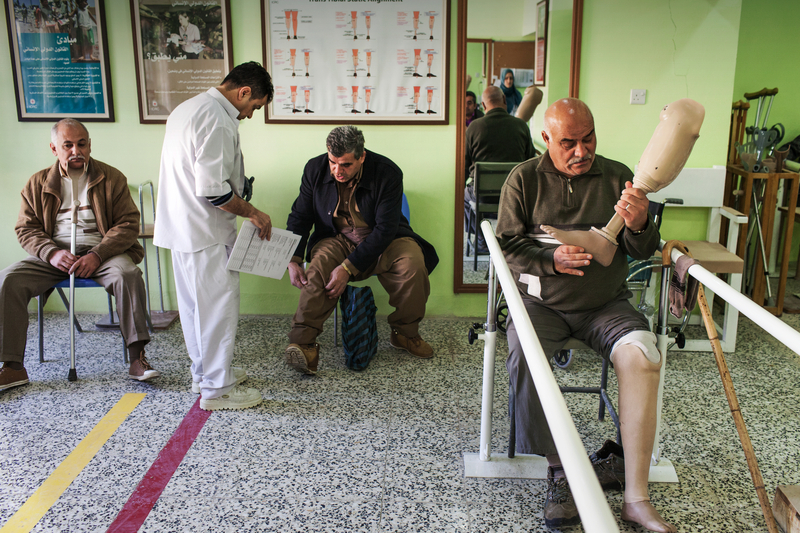 The ICRC has been supporting the Iraqi Physical rehabilitation Program since 1993. The Erbil PRC was established in 1996 to provide services for patients with physical disabilities in Iraqi Kurdistan Region. A patient who lost his left leg below the knee as he stepped on an anti-personnel landmine receive his assessment at the ICRC Erbil Physical Rehabilitation Centre (PRC). The ICRC has been supporting the Iraqi Physical rehabilitation Program since 1993. The Erbil PRC was established in 1996 to provide services for patients with physical disabilities in Iraqi Kurdistan Region. Aziz Enad, 51-years-old is seen during his assessment at the PRC (ICRC’s Physical Rehabilitation Center). Aziz lost his right leg in May 1988, three months before the end of the Iran-Iraq war. 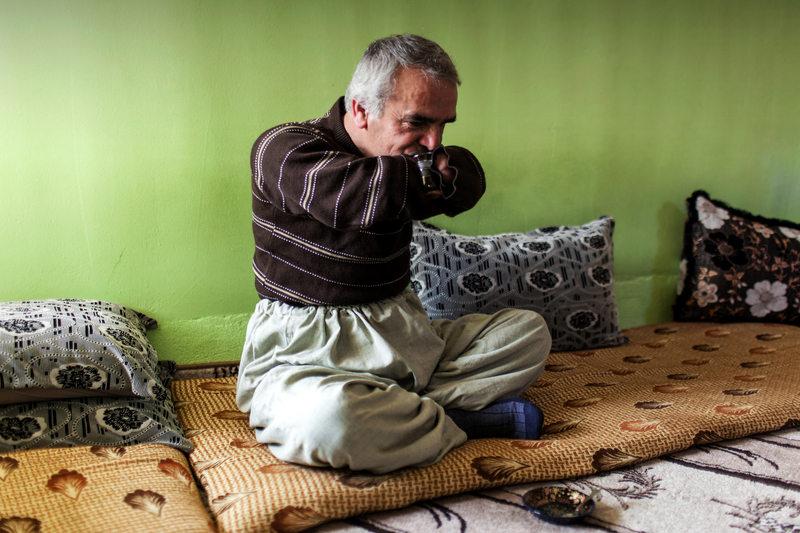 He was in the army on duty in Sulimanya as he stepped on an anti-personnel landmine in a mine field. He is unemployed since when he lost his leg and he has seventeen family members living with him. Aziz Enad, 51-years-old is seen at his house. 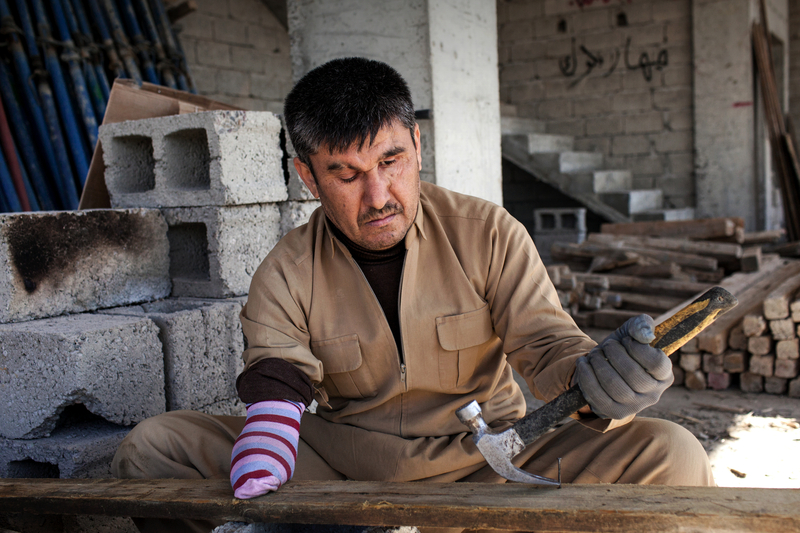 Aziz lost his right leg in May 1988, three months before the end of the Iran-Iraq war. 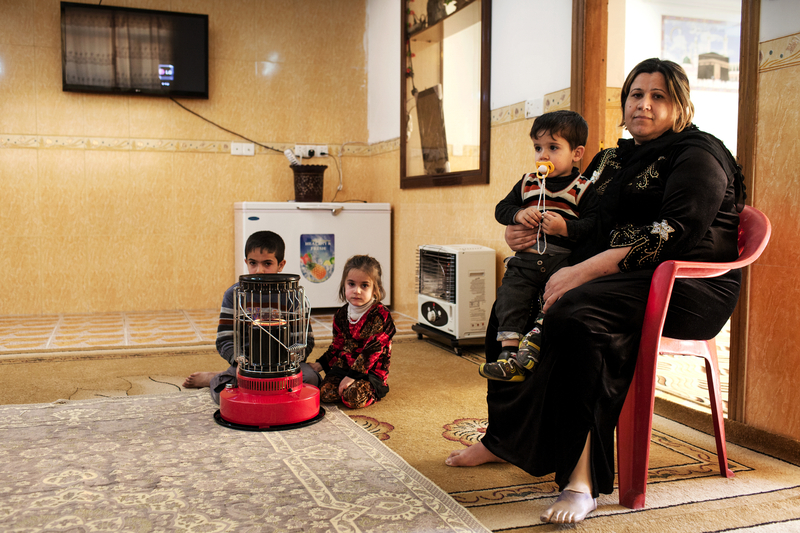 Sabiha Mahmoud, 34-years-old is seen with her children at her house. Sabiha lost her left leg below the knee on August 31, 1996 in the area of Khalkan in the Sulimanya Province as she was collecting wood on the outskirt of the city and she stepped on an anti-personnel landmine. Shamsadim Hammad, 46-years-old is seen drinking tea at his house. Shamsadim lost both arms below his elbow in 1978 when he was ten years old as he was with a shepherd walking in the mountains and he pick up a landmine that was laying on the surface of a land. In the accident he lost his left eye and got injured in his face by what was a Russian Pomz anti-personnel landmine. Auob Omar Hammadamin, 42-years-old is seen at his work place. Auob lost his right hand in Erbil in 1981 during the Iraq-Iran war. He was 11-years-old and he was playing with twelve of his friends in the street as they saw on the road a woman hand bag, inside there were two antipersonnel landmine which exploded killing immediately a girl and injuring him. 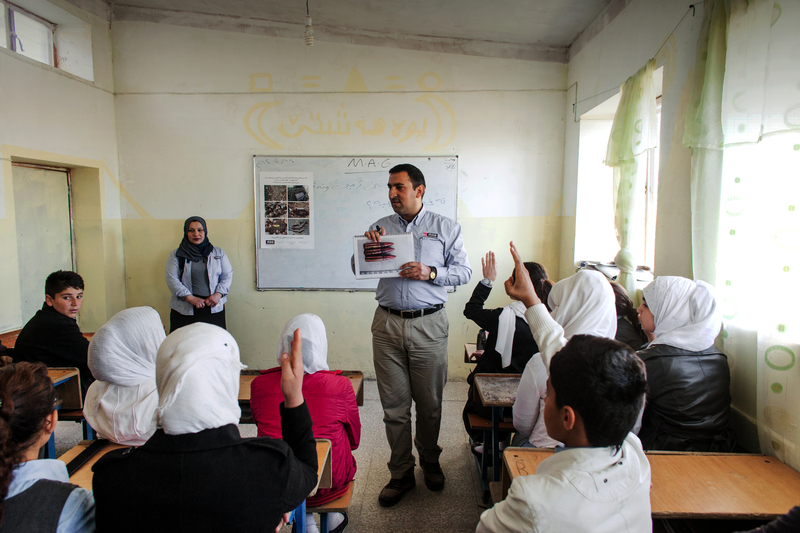 Iraqi students are seen as they attend the MAG (Mines Advisory Group) Mine Education and Awareness Program at their school. The beware school has 156 students ranging from 12 to 18-years-old organized in six classes. Mag delivered awareness in two classes. 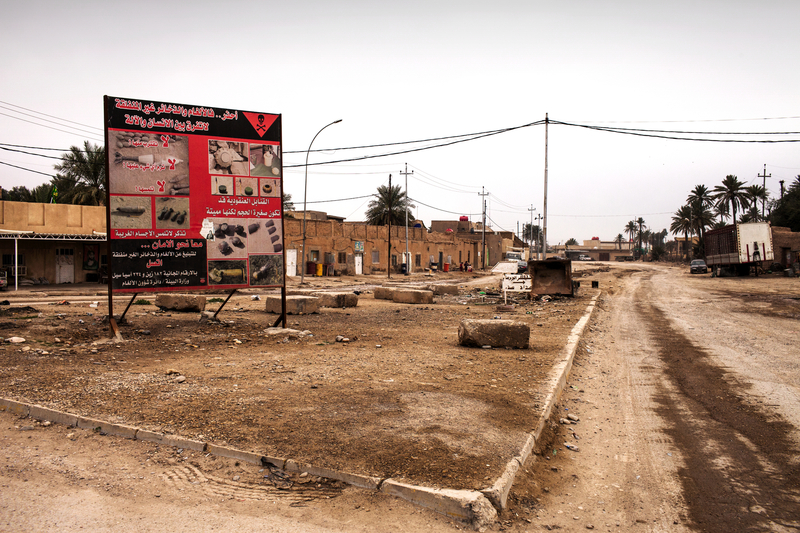 A bill board raising landmine awareness is seen in front of IMCO (Iraqi Mine Clearance Organization) office. The contaminated area in the Wermizyar village on which IMCO has started the clearing process on January 25, 2014 is about 972,000 meters square of which 77,760 meters square have already been cleared.